To make the circuit compact, I used a Transformerless power supply using an X-rated 474 capacitor. The rectified DC is around 20 volts so I used a 7812 voltage regulator to give stable 12 volts for the circuit. Green LED indicates the power on status. I used the Binary counter IC CD 4060 to give alarm after 30 minutes. It has 10 outputs which turn high one by one when the IC starts oscillating with resistor R5 and capacitor C6. The reset pin 12 of IC is connected at the junction between C5 and R4 so that the IC resets at power on and starts oscillating. Blinking of Yellow LED connected to the first output pin 7 indicates the oscillation of IC. After 30 minutes, pin2 of IC turns high and transistor T1 conducts, Red LED turns on and buzzer beeps. I used a small PCB type buzzer working between 3-12 volts but it’s sound is very high to catch attention even from outside the home. Caution: Even though I used a Transformer less power supply, a 9 volt transformer based power supply can be used. 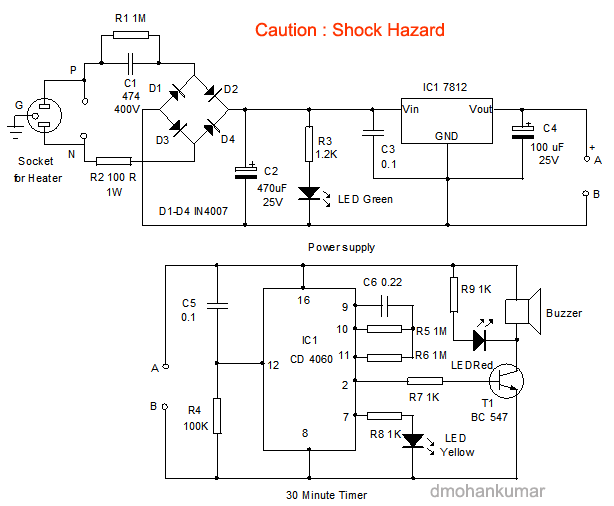 Transformerless power supply is dangerous if handled carelessly. It can give a fatal shock. So do not try it if you are not competent to deal with high volt AC. Use a transformer for the power supply for safety.